The average weight of ham is 5.5 lbs. to 6.5 lbs. The Pure Iberico Ham de Bellota Cinco Jotas 5J Boneless with an unparalleled juicy aroma and flavor is recognized worldwide as one of the most exquisite Spanish pure iberico hams. To achieve the special features of the Pure Iberico Ham de Bellota Cinco Jotas 5J Boneless, pigs are fed on acorns and aromatic herbs during the time of the Montanera. Possibly Pure Iberico Ham de Bellota Cinco Jotas 5J Boneless is considered the most well-known for its high quality and delicate flavor. The Pure Iberico Ham de Bellota Cinco Jotas 5J Boneless is a delicious tasting product made from hind limb of the Iberian pig, boned and molded to achieve higher performance. It contains a lingering aroma and a unique flavor. 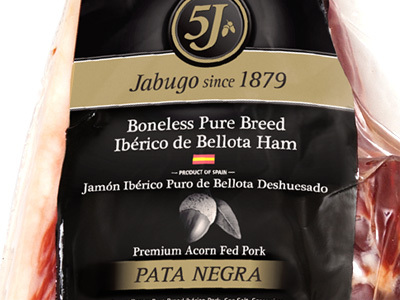 The Pure Iberico Ham de Bellota Cinco Jotas 5J Boneless has a uniform color with bright streaks of marbling that is the primarily responsible for the exquisite taste and sensory evaluation of this exceptional Spanish ham. The Pure Iberico Ham de Bellota Cinco Jotas 5J Boneless is one of the healthiest foods in the world because it contains few calories and their properties not only lowers cholesterol but it also enhances the activity of the nervous system. Cutting and conservation of Pure Iberico Ham de Bellota Cinco Jotas 5J Boneless are essential to properly exploit all that this product offers. The knife blade should be long, thin and sharp for filleting perfectly thus be maintained unchanged meat qualities. The strips should be small and thin, with some intramuscular fat to make them juicier. The edges should always stay clean, this will prevent off-flavors, and its cut is made just before serving. 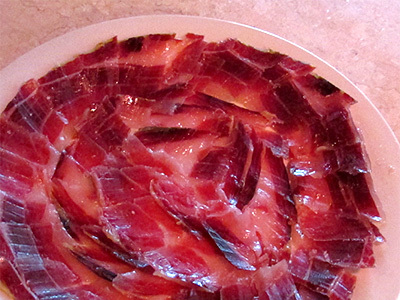 The Pure Iberico Ham de Bellota Cinco Jotas 5J Boneless should be stored in a cool, dry, and consume preferably at room temperature (between 20 and 25 degrees). Once the Iberico Ham de Bellota Cinco Jotas 5J Boneless is cut we suggest cover cuts with the cloth and outside layers that keep the ham surface fat for better conservation. The taste of a Pure Iberico Ham de Bellota Cinco Jotas 5J Boneless relies on your art and skills to cut the piece as well as possible. Carving the iberico ham in very thin or almost transparent slices makes flavor to be much better. that only the best pure iberico ham pieces are delivered to our customers. 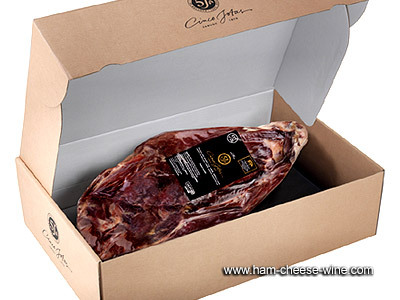 Ham Cheese Wine brings you now one of the best cured pure iberico hams cinco jotas 5J boneless with total warranty. Our company was created by Francisco Carrasco (Paco), professional master ham cutter licensed from Spain and settled in Miami, Florida, United States. 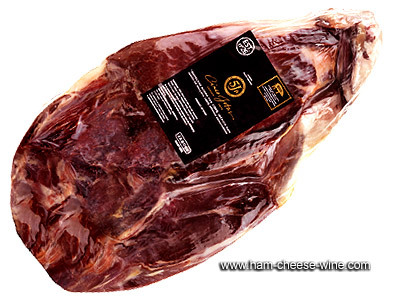 His experience of more than 25 years as a professional ham cutter guarantees you the best product choice of the best product Pure Iberico Ham de Bellota Cinco Jotas 5J Boneless. 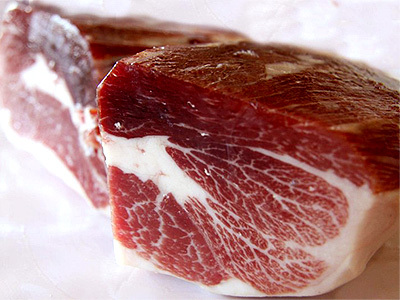 Why Pure Iberico Ham de Bellota Cinco Jotas 5J Boneless is considered as one of the Best Hams in the World? Long and flat pasture oaks, cork and other vegetative varieties provide a breeding spots for Iberian pig. Beyond the acorns and other fruits that make up their diet, terrain, and climate available in the area are key for the Pure Iberico Ham de Bellota Cinco Jotas 5J Boneless. The trees that make up the pastures are mainly Cork, Oaks and Encinas. The three species of the family Qercus typically produce the same fruit, the acorn. This source of oleic acid which ripens between October and November is the staple food of Pure Iberian Pig during the Montanera which is the main responsible to get an exquisite aroma and flavor in Pure Iberico Ham de Bellota Cinco Jotas 5J Boneless. pigs have to walk ten miles a day to find their food. This exercise strengthens its hind legs, providing the best hams. Moreover, this exercise allows the sugars contained in large quantities in the acorns from infiltrating into the muscle of their feet, resulting in a meager exquisite, a true delicacy worthy of the gods. view that consists in cutting and separating the best pieces, the salting consisting in putting the ham in contact with the salt for a certain period so that the salt penetrates its interior, the drying process that takes place in the dryer and complete natural maturation and, once matured the piece, is passed to the process called "aging", and that is carried out in natural cellars. As a result of the drying and aging, the water in the meat is reduced and the Ham get a greater concentration of solid, finally reaching the aroma and taste so characteristic of Pure Iberico Ham de Bellota Cinco Jotas 5J Boneless.